Nederland, Colorado has been my tiny mountain hometown for over a decade. Nederland, or Ned, as the locals refer to it, stands as the gateway town to Eldora Mountain Resort and parts of the Indian Peaks Wilderness. Whether you are up for a day of skiing or riding at Eldora, hiking the high country, traveling Peak to Peak highway, riding the local mountain bike trails, leaf peeping in autumn, attending Frozen Dead Guy Days, or just getting away from the commotion of flatlander life, this funky mountain town makes a great stop before, during, or after your adventures. One of the latest additions to Ned’s offerings is also one of my favorites. 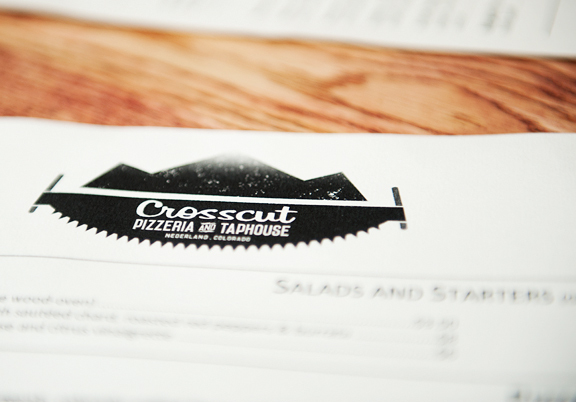 Crosscut Pizzeria and Taphouse began as a mobile wood-fired oven pizzeria. 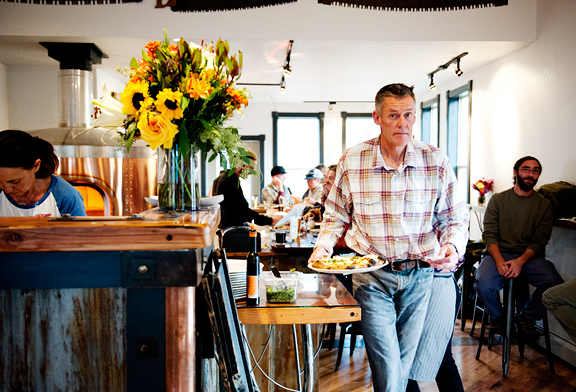 In the last year, Crosscut sprouted into a right proper restaurant in the heart of Ned’s downtown scene. Walk through the front door of this 100-year old rustic building and you’ll find sit-down tables on either side of you and the prep station, centerpiece copper wood-fired oven, and bar seating straight ahead. The restaurant radiates warmth (not just from the oven!) and a laid-back, welcoming mountain vibe. You get a great community feeling from this family-friendly establishment. 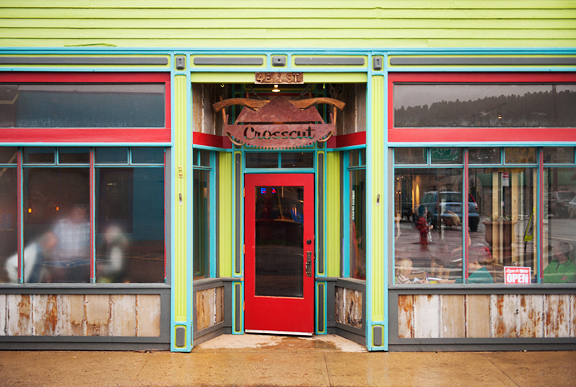 Jeremy and I wanted to sample Crosscut in the first week it opened for several reasons. First off – there was enormous buzz among the community in anticipation of the opening. Secondly, there was the promise of delicious artisanal pizza! Third, we always want to support good local businesses in such a small town as Ned. The staff was friendly and prompt despite being completely slammed both times we’ve been for dinner. We observed plenty of folks coming in to pick up take-out orders as well. Online ordering is now operational on the website. 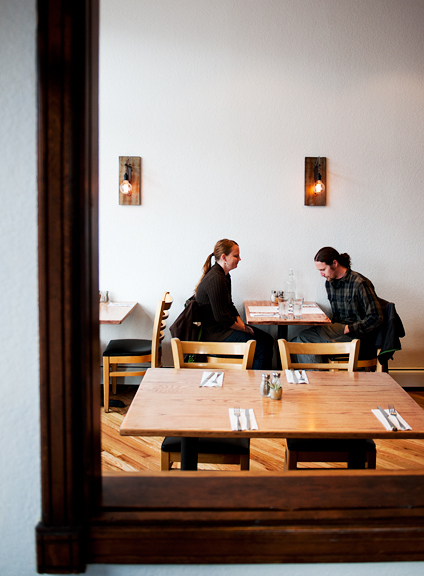 Crosscut’s menu has evolved in the last month as they work out suppliers, selection, and general growing pains. I think the restaurant will continue to tweak and improve their offerings here and there, but it is generally a very solid start. Crosscut is committed to incorporating locally sourced ingredients and humanely raised meats, and supporting those farmers and ranchers who produce these quality products. 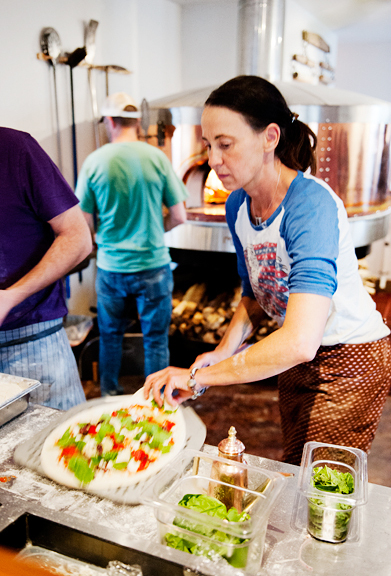 The pizza dough is made from organic locally-milled flour, and fermented for three days. Choose from over a half-dozen craft beers on tap, four wines (white and red) on tap, a wine list if you want to order a bottle or more, dry cider, and sodas like Mexican Coke and draft root beer. I see they have added a root beer float to the menu since last we dined there. I would have been all over that one. One of the best things about Crosscut’s food is how they respect vegetables. They don’t cook them to death and they allow the freshness and flavor to shine. We started our meal with the arugula salad and the polenta. All of the appetizers are gluten-free (as of November 2015). 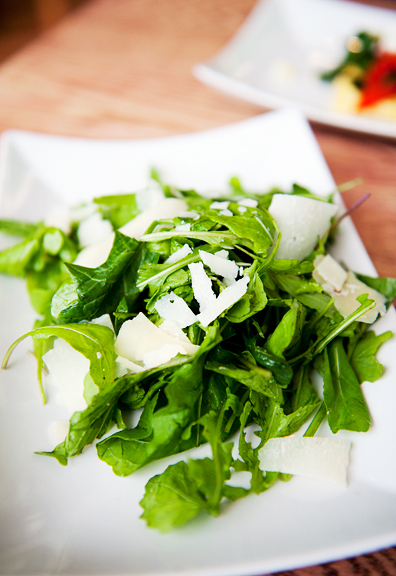 My arugula salad was simple and refreshing – spicy and slightly bitter greens tossed in a light citrus vinaigrette with big flakes of sharp asiago cheese. 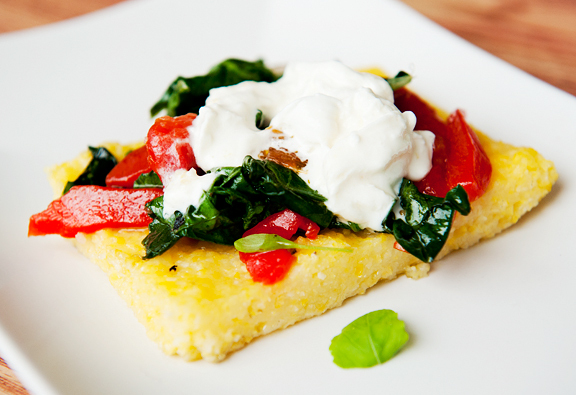 Jeremy’s baked polenta had just the right soft, creamy texture inside and crispness outside. The roasted peppers and sautéed chard lent an autumn earthiness to the flavor, and it was all topped with a velvety smooth dollop of burrata. This is the stuff that warms your soul. Now on to the pizzas – I mean, this is what it’s all about! 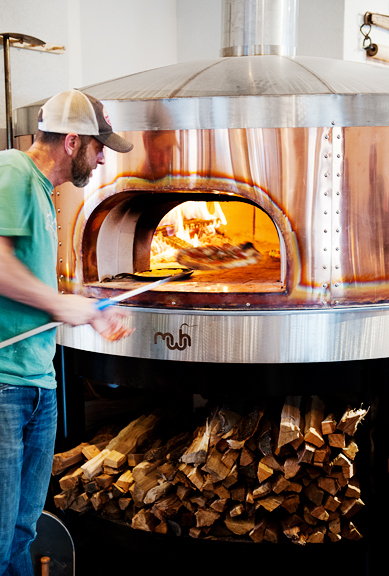 The pizzas are thin crust 12-inch pies, baked in the shiny copper wood-fired oven. Crosscut has recently added a gluten-free option, which is available upon request. Keep it simple with a cheese pizza or the classic Margherita (tomato sauce, mozzarella, fresh basil). Don’t like cheese? Don’t worry! The Marinara is topped with tomato sauce, oregano, and garlic, and its fancier cousin, Grand Mariner, adds anchovies and olives. Vegetarian options include a vegetarian special (currently a pesto base with spinach, ricotta, mushrooms, and fontina cheese), Grecian Yearning (Mediterranean style), and Farmed (white pizza). For the meat-eaters, choose from the fall special (currently sausage, mascarpone, fennel, apples, gorgonzola), Salto (sausage), Pueblo (pepperoni), or the Hawaiian (rosemary ham and pineapple). Both times we visited, we ordered two pizzas to get a decent sampling of the menu. The Pueblo came away the big winner for both of us since it’s essentially a road runner pizza – pepperoni and green chiles. 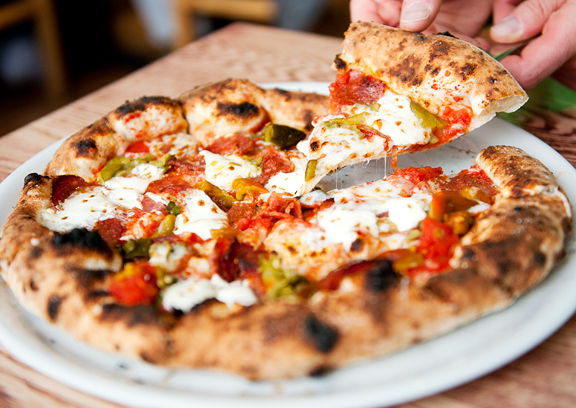 The green chiles come from Pueblo (Dawn’s hometown), in southern Colorado, and the pepperoni from Salazar Meats, a small-scale sustainable Colorado ranch/farm in the San Luis Valley. I liked the heat from the green chiles and the pepperoni was especially delicious. We both noticed with our first bites how fresh the tomato sauce tasted. Really tomato-ey. And they use fresh mozzarella, because anything less would be an insult to such good pizza. 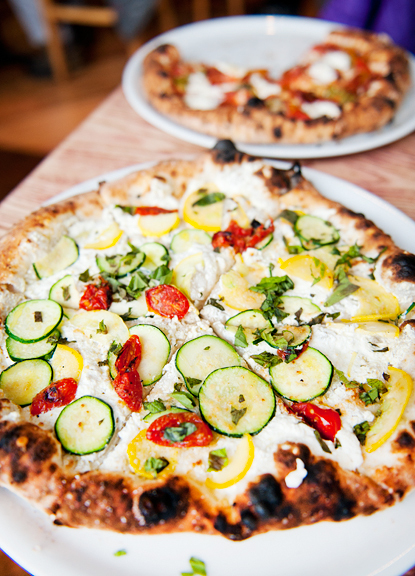 The other pie we ordered was Farmed, which arrived decked out in roasted tomatoes, thin slices of yellow and green squash, chopped basil, and lemon zest on top of ricotta cheese. This is the one that screams FRESH, full of bright flavors. If the sight doesn’t transport you back to summer, the taste of it surely will. On our second visit, Jeremy and I opted for the Salto, what I’ve dubbed The Sleeper. 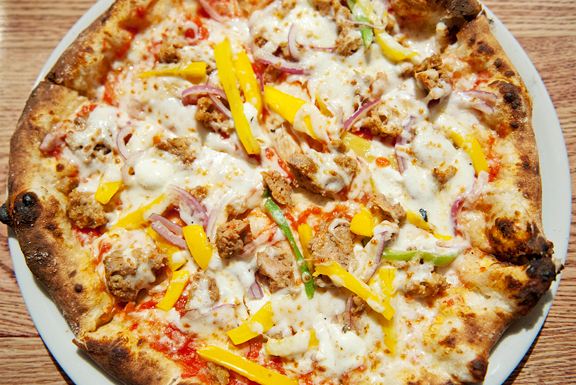 We always lean toward pepperoni, but figured it would be good to test drive a sausage pizza. I’m glad we did, because that is one excellent pizza. The Italian sausage is made by Clyde’s Sausage in Denver, packing the right combination of spice and heat to elevate any pie. The marriage of the sausage with roasted onions, sweet peppers, and mozarella on top of that lovely fresh tomato sauce is absolutely delicious. Pizza matrimony made in heaven. 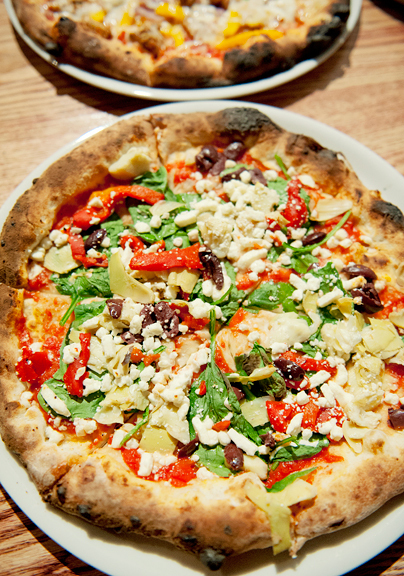 The fourth pizza we sampled from Crosscut’s menu was Grecian Yearning, a Mediterranean theme with a red sauce base, roasted peppers, olives, artichokes, spinach, and feta. I liked the pizza, but I didn’t love it. I think it was a bit wetter than the others, which can present structural issues on a thin crust pizza, and the combination of ingredients didn’t party in my mouth the way the other three pizzas did. That’s not to say this wasn’t a good pizza, just that the other three are clearly great pizzas. We get so excited about tasty pizza that we never seem to leave room for dessert, which is housemade ice cream. Should you have the power to resist filling up on appetizers and pizzas, I know the ice cream is damn good. How do I know? Because Shannon, the lovely staff member who makes the ice cream, told me she used some of the recipes from my blog! I spied a scoop topped with local Tungsten Toffee crumbles on their Facebook page recently… reason enough to save a little space in your belly. If you are ever in Nederland, consider dropping by Crosscut Pizzeria and Taphouse to quench your thirst and quell the grumble in your tummy. Or if you want a reason just to come to Nederland, let Crosscut be that reason. The atmosphere is welcoming, the food is most excellent, and the beer, root beer, and wine flow on tap. 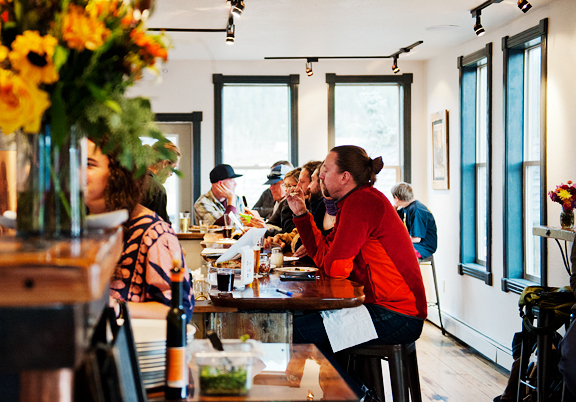 Every great mountain town should have a great pizza house – and now we do in Ned. Full Disclosure: No comps. All opinions are mine. Thrilled to hear a promising review of Crosscut! We were among those who watched the building renovation all Summer with high anticipation. We are returning to our home in the Ned area for the holidays, and must give this a try. Thanks -I enjoy your blog very much! Thank You Jennifer! Your photography skills are out of this world. Thank you for your kind words, and for taking the time to write such a comprehensive review. Shannon and I are big fans of your blog, and it’s thrilling to see our pizza place within it. Thank you with all our hearts. 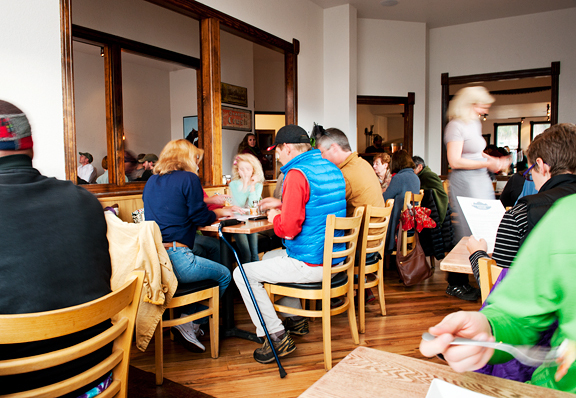 Mary Karen – yes, Crosscut is a must-visit as is Salto Coffeeworks (which I’ll write up in a month or so)! Jill – yay! They are totally worth the drive! You know, Jen, Google Maps is great: Long, long before your article above I was looking for your Nederland (and yes, you can zoom it in) and I followed your routes to Crested Butte and all that. Loved it to be in your footsteps anyhow…. The pizza pueblo looks great. Yummm… And the Farmed one looks as if it was made with lots of love…. The lifting of the secret of the ice cream made me laugh!